Mostly visited for – Bengaluru (capital and entry point of Karnataka), Bijapur (historical monuments built during Adil Shahi dynasty rule), Badami (regal capital of Chalukyas famous for rock cut temples), Hampi (a site of ruins of the Vijayanagar Empire), Halebid (this ruined Hoysala capital comprises two antique temples – Hoysaleshwara and Kedareshwara), Hassan (temple-architectural capital of Karnataka), Shimoga (gateway to the highest waterfalls in India - Jog), Mysore (where you can discover a technicolour Devraja market and the pompous Maharaja’s Palace), Madikeri (the hill town serving headquarters to Coorg, a coffee producing hill station of India), Udupi (a culinary destination famous for its delicious vegetarian food) and beautiful beaches like Bhatkal, Mangalore and Malpe. Adventure – The state is known for ample adventure opportunities including Trekking, Parasailing, Paragliding & Microlight Flying, Water Sports and Fishing at Cauvery Fishing Camp. Weather - Summer: March to May, Monsoon: June to September, Winter: October to February. Characterised by equable climate, Karnataka enjoys varied climate in different zones of the state. Coastal Karnataka enjoys tropical weather, whereas North Karnataka is known for cooler temperatures. By Air - The most important airport of the state is located in Bengaluru. Nearly all airlines connect the city with major cities in India. By Rail - The state capital, Bengaluru, is the most important Railway Station and is regularly served by important trains. Many prime tourist destinations of South India can be accessed by train from Bengaluru and other Railway Stations in Karnataka. By Road - The state boasts of an excellent road network with the rest of the country. 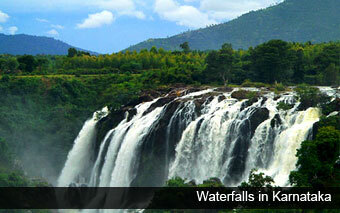 Major cities and tourist destinations in South India are at approachable distance by road from Karnataka. 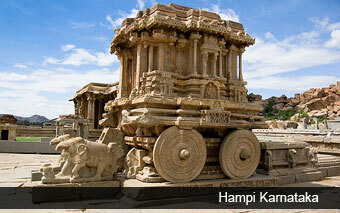 Karnataka is a tapestry of colours, cultures, flavours, landscapes, timelessness and bewitching beauty. The recorded history of Karnataka is more than 2 millennia old. The earliest known references of the region under modern Karnataka can be sourced from Mahabaharata, the ancient epic of India. Even scholars like Panini, the father of Sanskrit, astrologer Varahamihira, and other visionaries also explored this rich bountiful region through their illustrated works. This rich resourceful kingdom gave rise to many kingdom dynasties, popular among them include Hoysalas, Chalukyas, Rashtrakutas, Vijaynagara empire. Other ruling dynasties which got attracted towards this region were the Bahmani, Biapur and famously Tipu Sultan under the state called Mysore. Later as per the state reorganization act, the state got reunited as Karnataka in the year 1956. Geographically, the state is bordered by Arabian Sea westwards, Goa in the northwest, Maharashtra in the north, Andhra Pradesh in the east, Tamil Nadu and Kerala in the south. A part of Western Ghats, a recently recognized world heritage site for its natural bounties, comes under Karnataka topography, giving birth to many wonderful tourist attractions in River Godavari, Cauveri, Krishna, South Pennar and Palar. Here, the Western Ghats and Eastern Ghats of South India converge into Nilgiri Hills, forming a perfect backdrop for different hill stations, beaches, waterfalls and a blessing of bestowed wonder. Besides this, the state also is rich in various mineral resources including asbestos, chromite, dolomite, gold, iron ore, manganese, silica sand, etc. The major gold mining centers in the state are in Kolar and Raichur. The evergreen forests of the state are equally valuable, providing it the continuous supply of Teak and Rosewood. Culturally, the state is a rich goldmine of rich art forms. The diversified rich linguistic along with glorious history have become an evidence of its rich elaborated culture. This can be sensed from its deep rooted co	nnect with Carnatic music, a revered exponent of Indian classical music. Besides this, the colourful heritage of the state can be explored via its intricate dance forms and performances. Famous among them are Yakshagana, a classical dance drama and Mysore Bharatnatya style, etc. Karnataka’s share of heritage can also be cherished through tourism. The heritage circuit of Karnataka including Mysore, Belur, Halebid, Hassan, Sravanabelagola and Hampi can be revisited any time throughout the year. Tourists who want to experience the detailed amalgam of heritage and culture can board the south India’s first luxury train, the Golden Chariot. Inspired by the stone chariot, this train provides a decent serving of heritage, culture and hospitality with a hint of Karnataka’s hospitality. Eat – Cuisine of Karnataka is balanced concoction of nutrients. Food serving in Karnataka is based on balancing the essential components of a meal including proteins, carbohydrates and vitamins. The must try food items during Karnataka tour must include Bisi Bele Bath, Davanagere Benne Dosa, Uppittu, Ragi Rotti, Akki Roti, Saaru, Kesari bath, Bangi Bath, Khara Bath, Ragi Mudde, Sambar, Rasam, Adyes (dumplings), Ajadinas (dry curries), Chutneys, Spicy Meat (Pork, Pandi Curry, Chicken and Mutton), Kadumbuttu (round balls made from rice), Paputtu (steamed rice cake), Thaliyaputt, etc. While in Mysore, tourists must try Mysore Pak, a royal sweet straight from the royal court of the city. Buy – The crafted state of Karnataka is known for its intricate art forms of Wood Carving, Ivory Carving, Stone Carvers, Sandalwood Craft, Doll Making, Metalware. The Karnataka Mysore Paintings are another prized possession from the heart of the state. Hotels – The hotel range in Karnataka is varied from economy to luxury, catering to the visitors from every class.